Where to start... yesterday was insanely busy and insanely hot (what would be a blog from me without a temperature update - yesterday was a three shower day!!!) We had a lot of treatments to get through, however it's not about just getting them done, it's about conducting thorough physical exams (learn a bit more about physical exams here) and making sure we know what's normal or abnormal for each individual turtle. 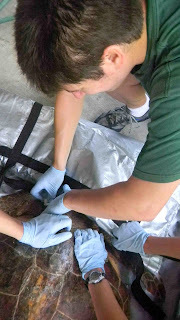 We started the day with a treatment on the tiny loggerhead. 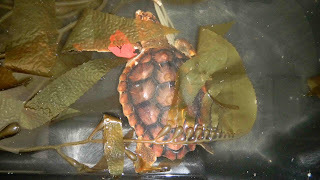 They don't name the turtles here but I secretly call this one Louisiana Red (Red Louie for short). 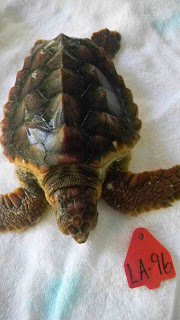 Loggerheads have a red tinge to their shells but the young animals are a brilliant red, I'm sure the color is somewhat lost in photos so you'll have to take my word. 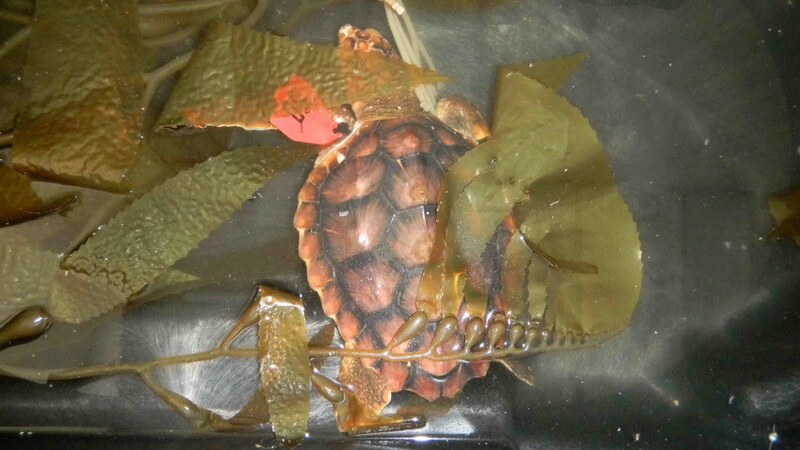 Red Louie has been listing to one side a little and is caudally buoyant (his rear end floats). He is eating and beginning to stabilize. We will bring Red Louie for another set of X-rays within the next week to see if he has moved any of the air in his GI tract. 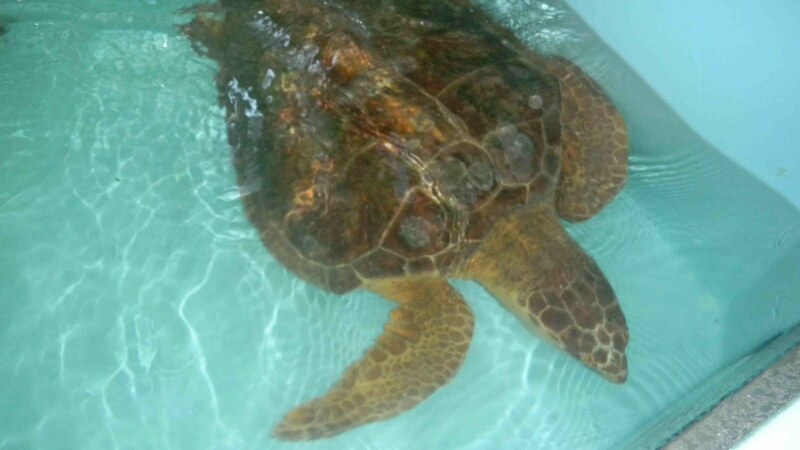 Below are photos of Red Louie during his physical exam/treatment and then in his pool after his treatment. He loves to hide under the plant life in his pool. 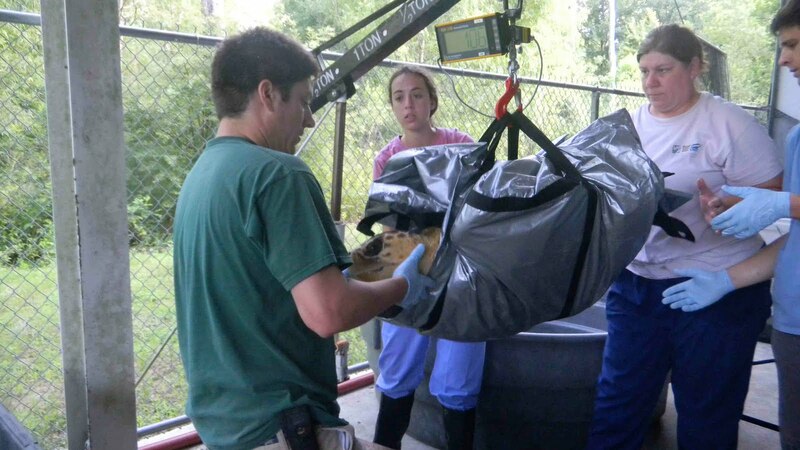 In the photos below, Dr. Boylan from the South Carolina Aquarium leads a team in obtaining a weight on the large loggerhead. She is gaining weight nicely and is improving daily. 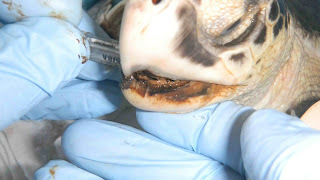 In the center photo, Dr. Boylan cleans an area of skin with a disinfectant in preparation for an antibiotic injection. The last photo on the right shows the big girl back in her pool after the weight and treatment. 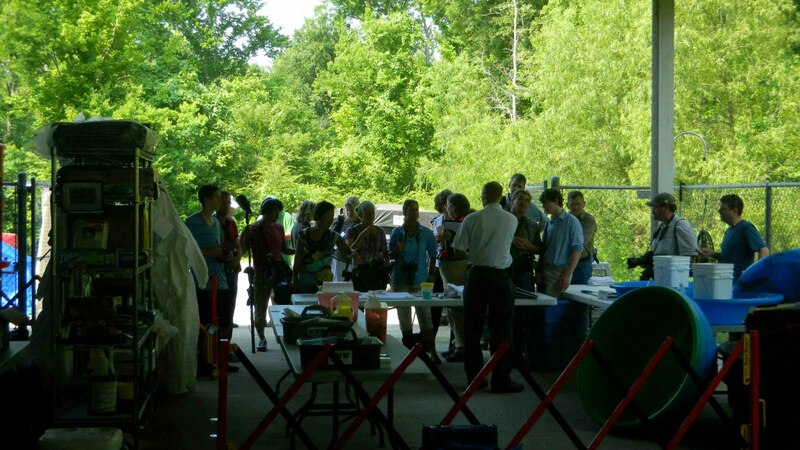 Audubon Aquarium of the Americas (AOA) hosted a significant media event yesterday to help spread the word on the oil spill recovery efforts with sea turtles. This was an important event and as you can see from the photos, it was well attended. 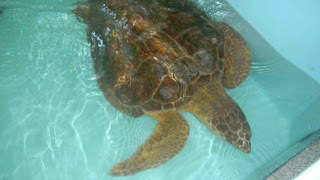 AOA is doing a great job and service to the sea turtle efforts by getting the story out to the media and the general public. 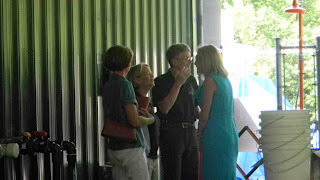 I took the photos below as the media was setting up and preparing for the press conference - I felt like a reverse paparazzi! The photos didn't come out great as I was way in the back of the warehouse. 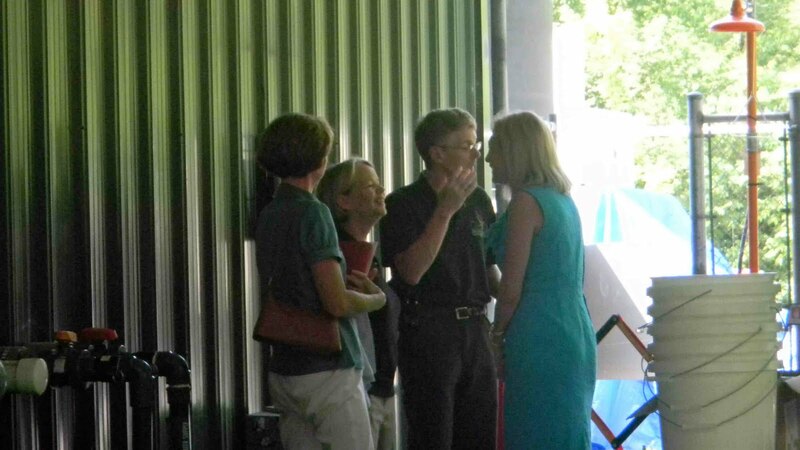 On hand for the press event were a lot of important people, none more important then Barbara Schroeder. Barbara can be seen in the photo below, second from the left. Barbara is in charge of sea turtles for the NOAA Fisheries Service. She provides a voice for sea turtles where there wouldn't otherwise be one. She is a true champion for sea turtles - a total rock star in my book! In addition, Barbara is one of the nicest people you could ever hope to meet. She made a point to come over and thank us for working long hot days to save these endangered and threatened sea turtles. Her thanks and praise go a long way and was important to all of us. The day ended with three new turtles coming in last night. 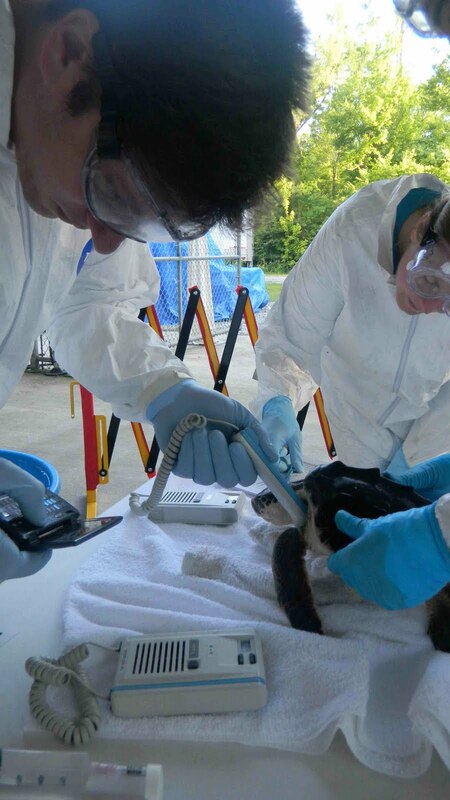 We had to suit up in the tyvek and other protective clothing to work with these animals as they were collected at sea and oiled. 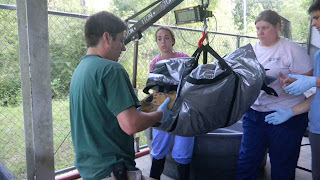 Standard protocol is used in obtaining all the proper information on each animal. They then go to the medical station where we give them a physical exam and collect basic health information. After that they go to the washing station for a bath. The final step is back to the medical station for a detailed de-oiling of the sensitive areas such as the eyes and oral cavities. All of this happens quickly and quietly to minimize the stress levels in the sea turtles. In the photo below on the left Dr. Boylan uses a doppler to collect a heart rate on one of the new oiled Kemp's ridleys. The photo on the right shows the bathing process. The photo on the left shows Dr. Boylan opening the mouth of one of the new turtles. 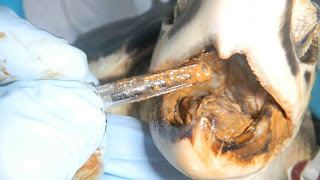 Externally there doesn't seem to be much oil however in the photo on the right you can see a cover of oil in the oral cavity. This isn't nearly as bad as we've seen but it's not good for the turtle. Note: Connie's patients are collected from the Gulf when weather permits. 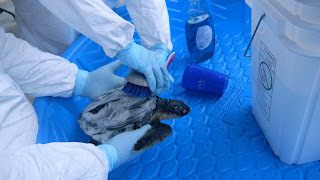 A reporter with National Public Radio recently met Dr. Brian Stacy (see pictures of him cleaning turtles at sea in this recent post) at the docks with a batch of turtles plucked from the sludge. Click here to listen to NPR's story for an idea of where Connie's patients have been found, and what they're up against. I just love your updates and seeing each new turtle! Wonderful work! I love what you're doing, I'm a soon-to-be senior in high school and this is what I want to do with my life! How do I get there? Can you recommend a school or field of study? This is so cool and exciting! Thank you for helping this wonderful creature, innocent victims of this horrible disaster. Mae, Amanda and Anonymous - thanks for taking the time to comment and my apologies for the slow response. It was all I could do to get the blogs up after a long day of working with turtles so there wasn't much time for checking email and comments. Amanda - I would recommend several different areas of study, but it depends on your area's of interest. YOu could start by looking into wildlife biology, veterinary medicine, veterinary technician degrees, or zoology. There are other areas as well but these are a good place to start. Good luck to you!